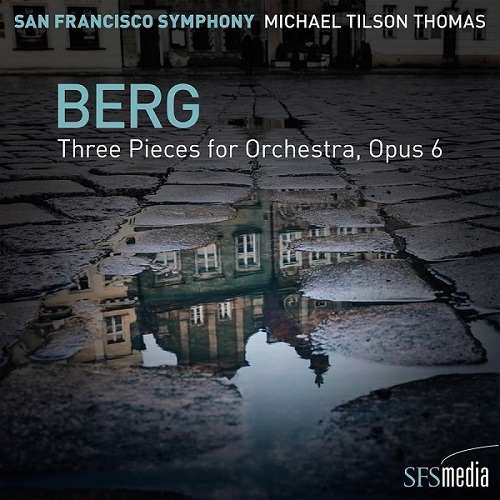 SAN FRANCISCO, CA (June 30, 2017) Music Director Michael Tilson Thomas (MTT) and the San Francisco Symphony (SFS) today released SFS Media’s first-ever digital-only album, Berg: Three Pieces for Orchestra. Recorded during live performances at Davies Symphony Hall in January 2015, the album is available now for streaming and download in stereo, 5.1 surround, Mastered for iTunes quality, and 24-bit/192kHz Studio Master. SFS Media is the San Francisco Symphony’s eight-time Grammy Award-winning in-house record label which celebrates its 15th anniversary this year, marking a decade and a half of innovations in recorded media. Digital press room including press downloads are available via the website: www.sfsymphony.org/bergpress. Please contact You You Xia at yxia@sfsymphony.org for login credentials. Click here for a short video with MTT’s commentary on this recording. Three Pieces for Orchestra had its first SFS performance in February 1978, with Edo de Waart conducting. SFS Media is the San Francisco Symphony’s award-winning in-house label, launched in 2001. SFS Media releases reflect MTT and the SFS’s artistic vision of showcasing music by American composers as well as core classical masterworks and embody the broad range of programming that has been a hallmark of the MTT/SFS partnership. Recorded live in concert and engineered at Davies Symphony Hall, the audio recordings are released on hybrid SACD and in high-resolution digital formats. SFS Media has garnered eight Grammy awards. SFS Media also produces and releases documentary and live performance videos, including the SFS’s national public television series and multimedia project Keeping Score, which included three seasons of television episodes, eight documentaries, and eight concert films designed to make classical music more accessible to people of all ages and musical backgrounds. The Keeping Score series is now available as a digital download and on DVD and Blu-ray. Other videos of the San Francisco Symphony available from SFS Media include A Celebration of Leonard Bernstein: Opening Night at Carnegie Hall 2008 and San Francisco Symphony at 100, a documentary about the Symphony’s history, which won a Northern California Emmy Award. All SFS Media recordings are available from the Symphony Store in Davies Symphony Hall and online, and from all major retailers and other digital outlets worldwide including iTunes, Amazon, AppleMusic, Spotify, HDTracks, and Qobuz. SFS Media recordings are distributed in the U.S. and Canada by the [PIAS] Group via RED Distribution and Sony Music Canada, through Avie Records internationally, and by The Orchard to digital retailers. Recorded live January 21-23, 2015 in PCM 192kHz/24-bit audio in Davies Symphony Hall, San Francisco. Connect with the San Francisco Symphony on Facebook, Twitter, YouTube, Instagram, and Soundcloud. The San Francisco Symphony receives support from over 10,000 individual donors and 150 partner institutions. Emirates is the Official Airline of the San Francisco Symphony. San Francisco Chronicle / SFGate.com is the Official Media Partner of the San Francisco Symphony. Questa voce è stata pubblicata in Dal mondo della musica e contrassegnata con Alban Berg, Michael Tilson Thomas, SFS Media label, the San Francisco Symphony. Contrassegna il permalink.